Computer Networking A Top-Down Approach Chapter 4.7. 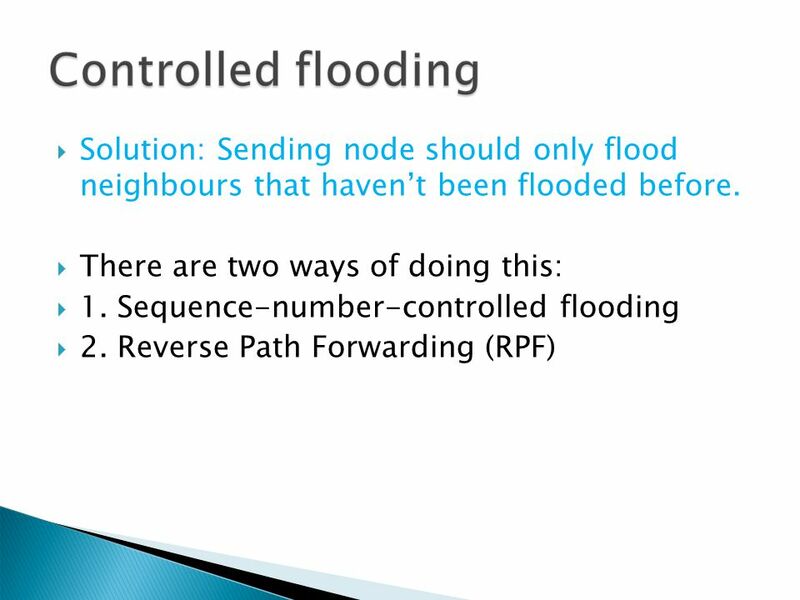 2  When a packet is needed to be sent from a source node to ALL other nodes in the network.  Example: A company needs to upgrade a program in all computers at the office building. 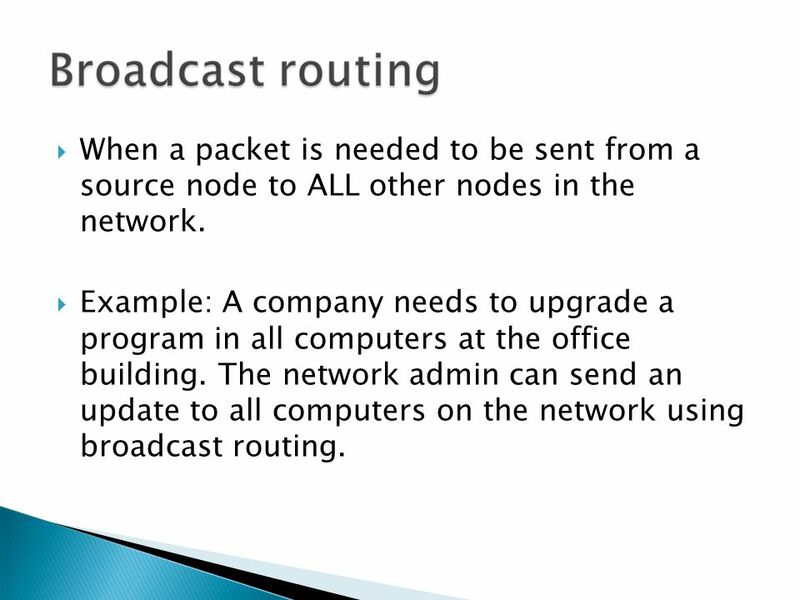 The network admin can send an update to all computers on the network using broadcast routing. 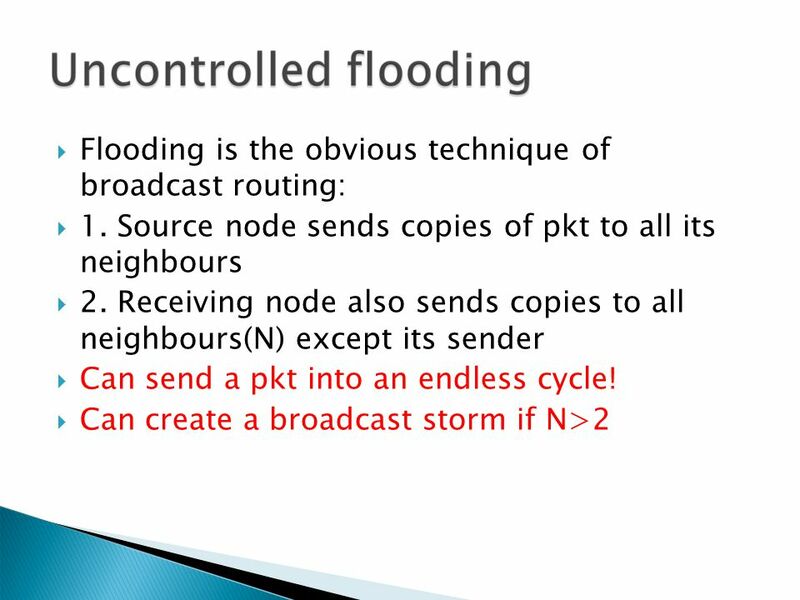 4  The source node(R1) sends duplicates of a pkt to the N destinations (R3 & R4).  The network nodes (R2) should instead create duplicates to the final destinations (R3 & R4).  All destination addresses needs to be known: adds extra overhead and complexity. 8  Router only transmits pkt if it arrived on shortest unicast path back to the source B, C, D, E and F receives one or two redundant packets! 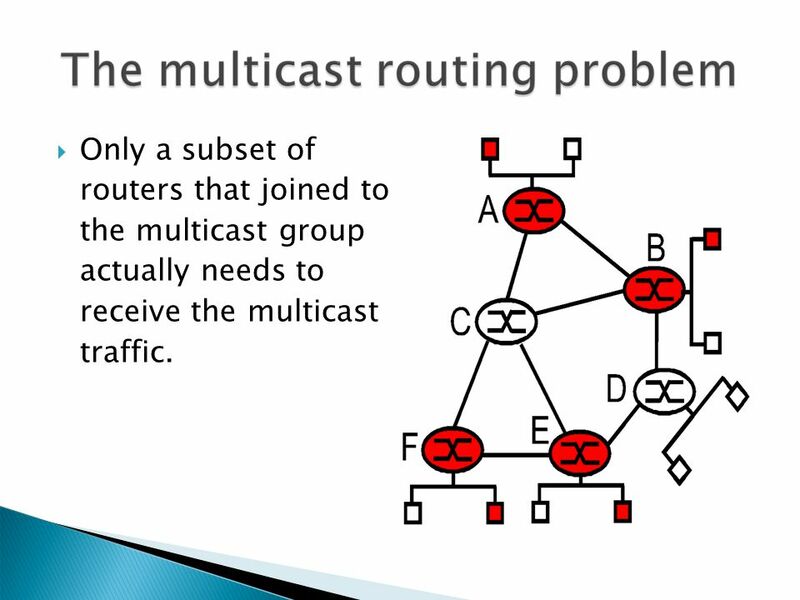 14  Only a subset of routers that joined to the multicast group actually needs to receive the multicast traffic. 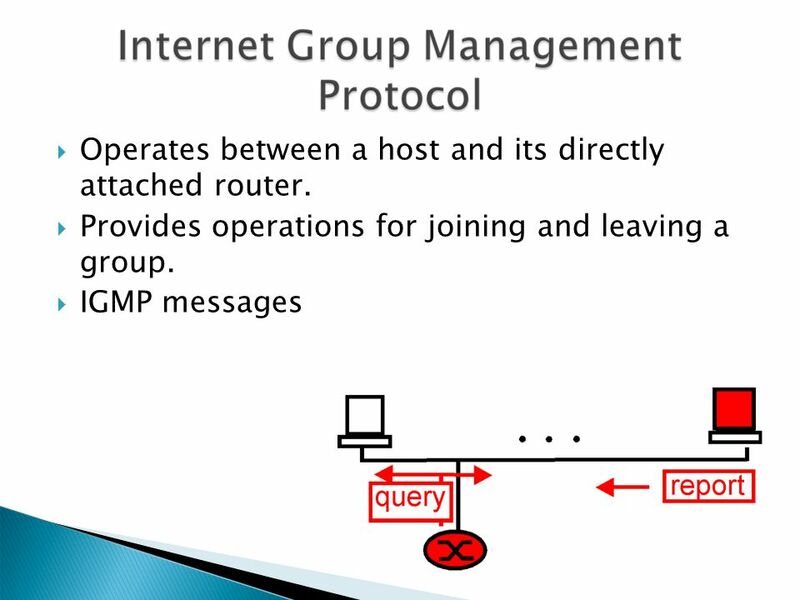 15  Goal to find a tree of links that connects all of the routers that have attached hosts belonging to the multicast group. 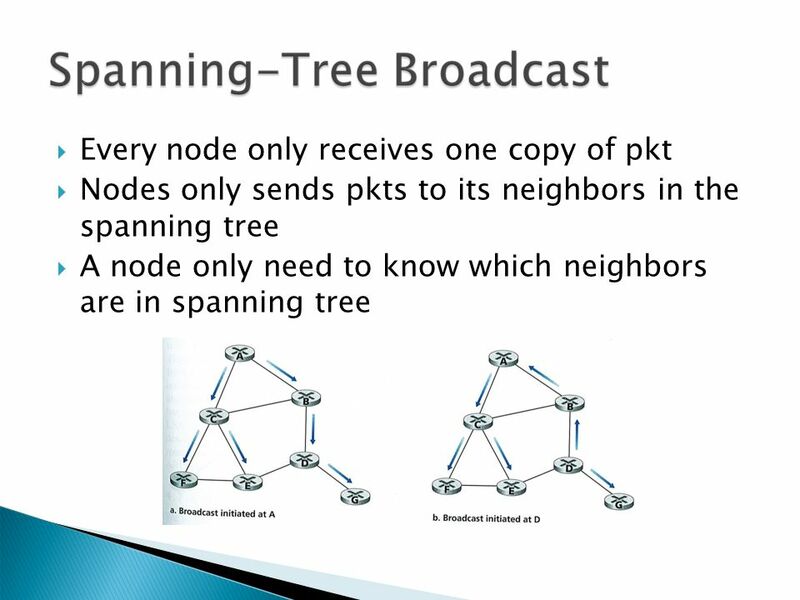  Two approaches: ◦ Multicast routing using a group-shaded tree. 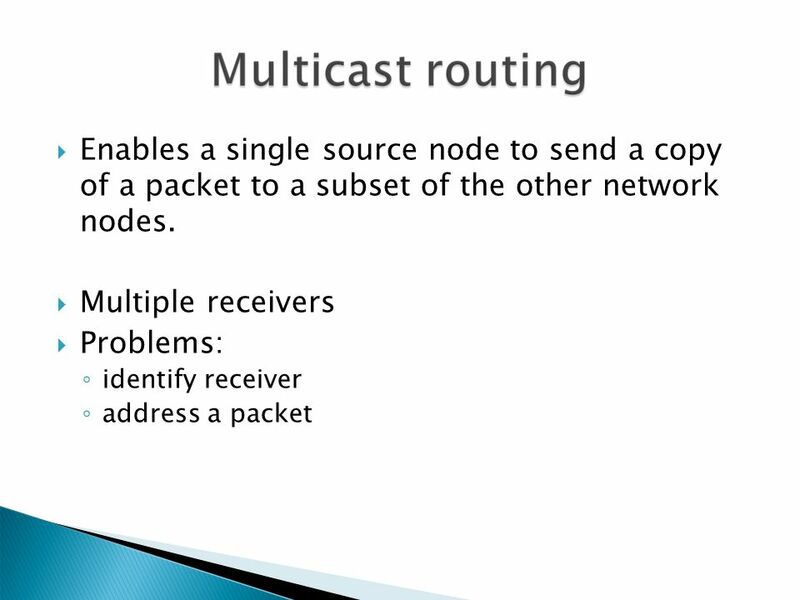 ◦ Multicast routing using a source-based tree. 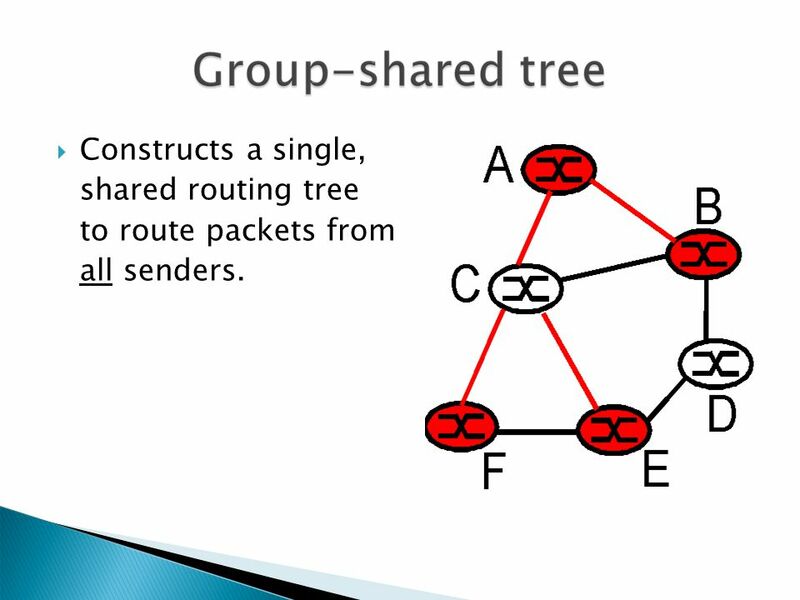 16  Constructs a single, shared routing tree to route packets from all senders. 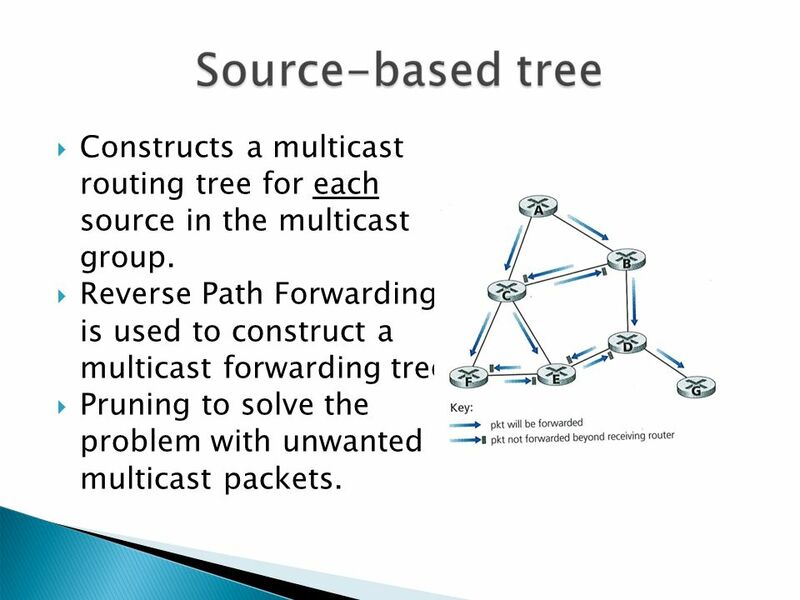 17  Constructs a multicast routing tree for each source in the multicast group. 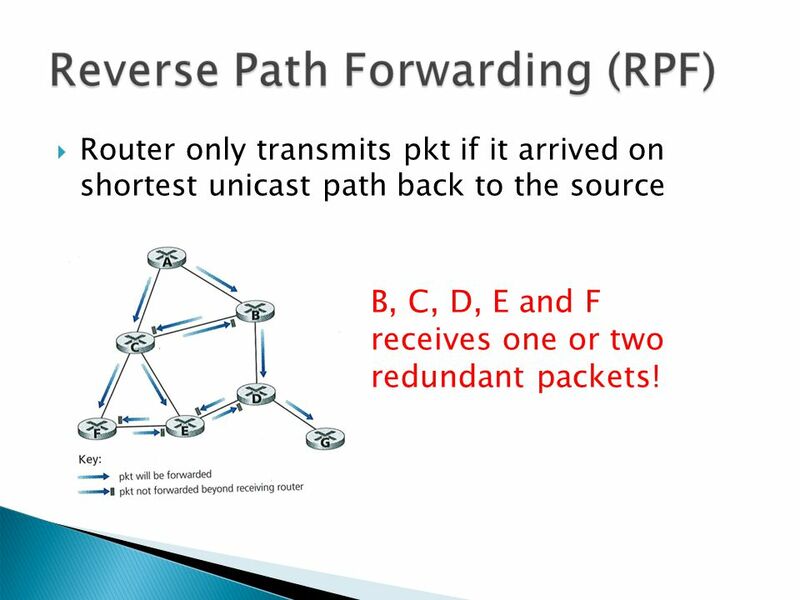  Reverse Path Forwarding is used to construct a multicast forwarding tree. 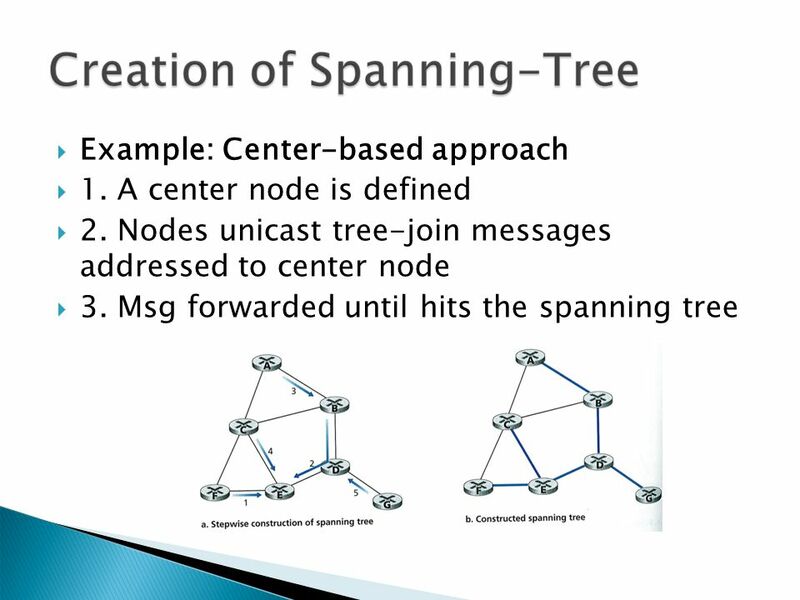  Pruning to solve the problem with unwanted multicast packets. Download ppt "Computer Networking A Top-Down Approach Chapter 4.7." 11-1 Last time □ Distance vector link cost changes ♦ Count-to-infinity, poisoned reverse □ Hierarchical routing ♦ Autonomous Systems ♦ Inter-AS, Intra-AS. 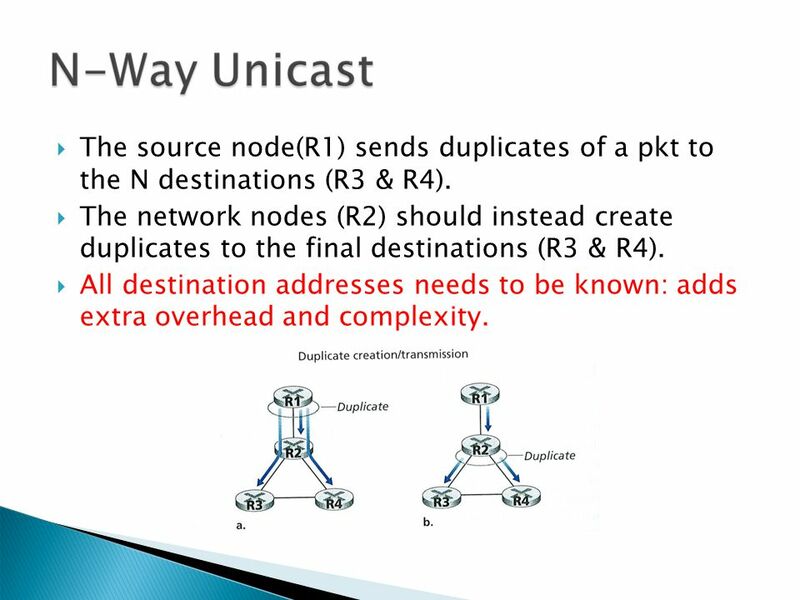 Introduction 1 Lecture 22 Network Layer (Broadcast and Multicast) slides are modified from J. Kurose & K. Ross University of Nevada – Reno Computer Science. Multicasting 1. 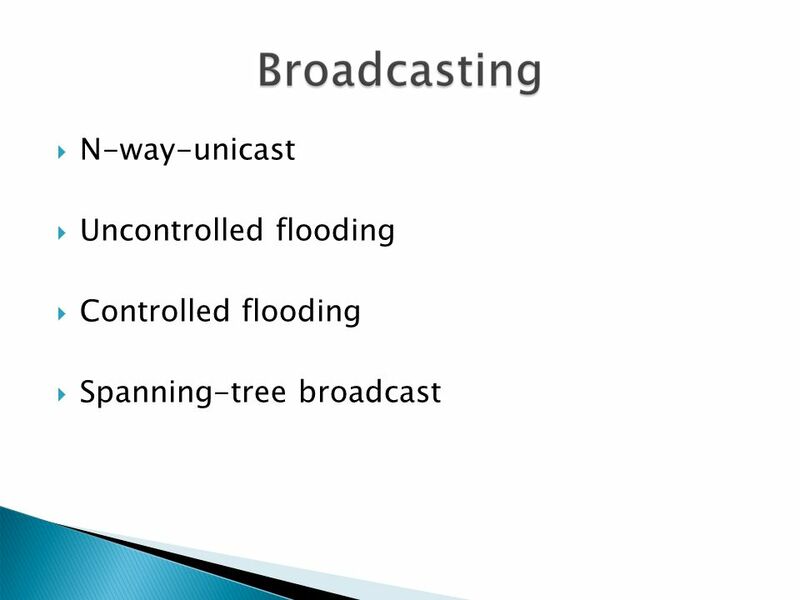 Multicast Applications News/sports/stock/weather updates Distance learning Configuration, routing updates, service location Pointcast-type. Multicast on the Internet CSE April 2015. 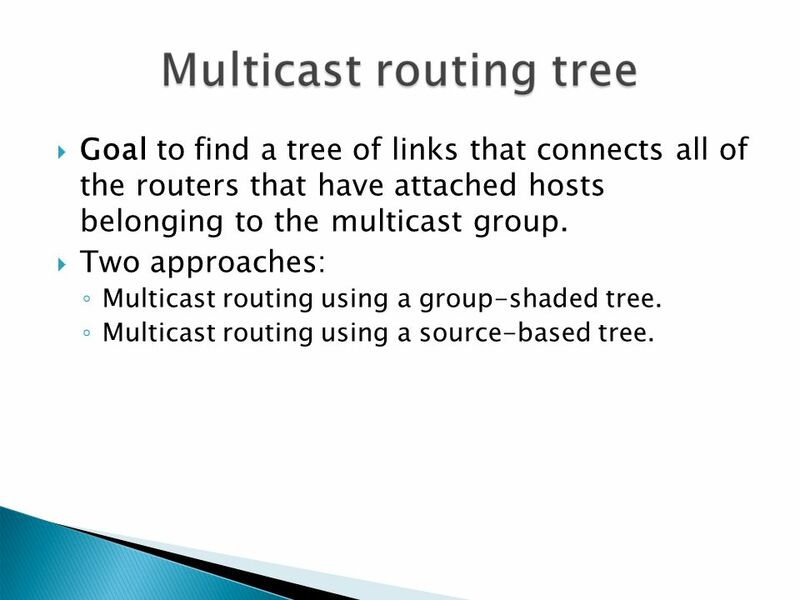 Multicast Routing: Problem Statement r Goal: find a tree (or trees) connecting routers having local mcast group members m tree: not all paths between routers. 1 Internet Networking Spring 2004 Tutorial 7 Multicast Routing Protocols. 1 Internet Networking Spring 2006 Tutorial 7 DVMRP. Routing So how does the network layer do its business? COS 420 Day 18. Agenda Group Project Discussion Program Requirements Rejected Resubmit by Friday Noon Protocol Definition Due April 12 Assignment 3 Due. CMPE 150- Introduction to Computer Networks 1 CMPE 150 Fall 2005 Lecture 22 Introduction to Computer Networks. 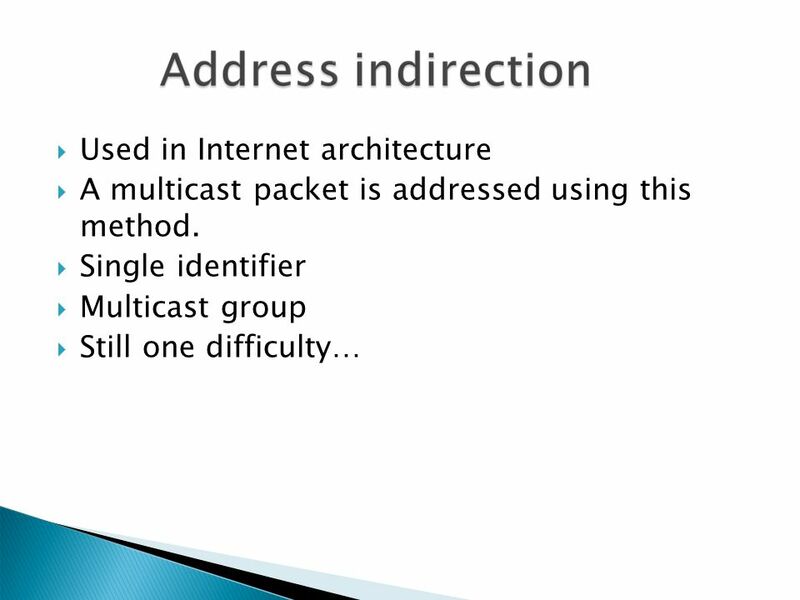 Slide Set 15: IP Multicast. In this set What is multicasting ? Issues related to IP Multicast Section 4.4. 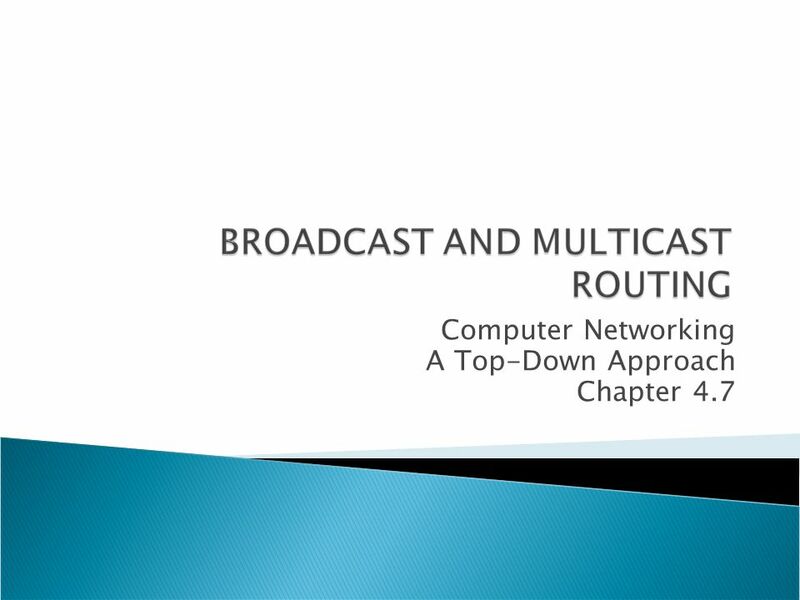 Computer Networking Lecture 24 – Multicast. 1 IP Multicasting. 2 IP Multicasting: Motivation Problem: Want to deliver a packet from a source to multiple receivers Applications: –Streaming of Continuous. 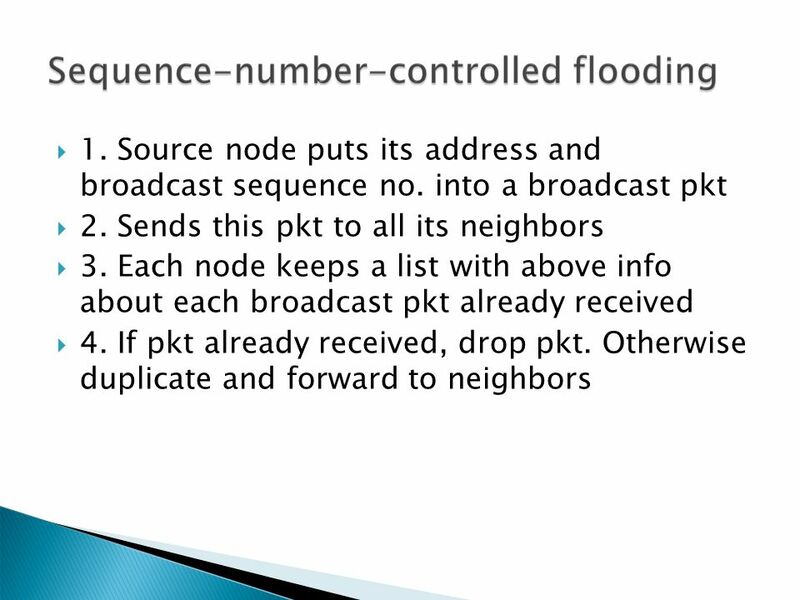 EE689 Lecture 12 Review of last lecture Multicast basics. Wolfgang EffelsbergUniversity of Mannheim1 Multicast IP Wolfgang Effelsberg University of Mannheim September 2001. © Janice Regan, CMPT 128, 2007-2012 0 CMPT 371 Data Communications and Networking Multicast routing.